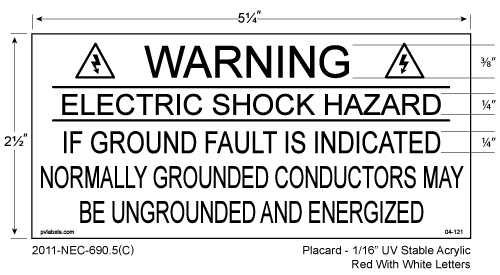 Standard - Red and White 4" X 3"
PV Solar Warning Placard 4" X 3"
Premium Laser Cut Placard with red background white lettering. ANSI lettering upgrade is available in .040" Aluminum with baked on white enamel paint. Per NEC 690.5(C) Place on inverter or near GFI reset. 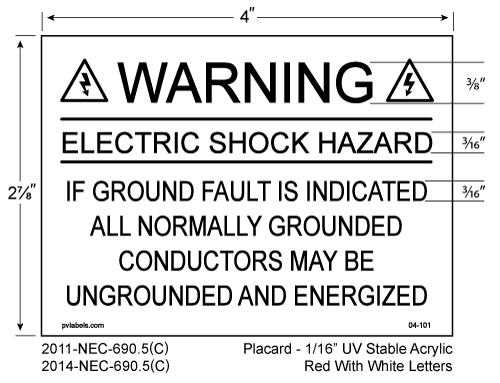 WARNING ELECTRIC SHOCK HAZARD IF GROUND FAULT IS INDICATED, NORMALLY GROUNDED CONDUCTORS MAY BE UNGROUNDED AND ENERGIZED. When the photovoltaic system also has batteries in a visible location at the batteries. *NEC code reference is for information only. Refer to the NEC 2011 guide for complete descriptions. Click the button below to add the 04-101 PLACARD to your wish list.